Modeling Phytophthora ramorum: Several Phytophthora ramorum risk models have been developed for the USA, Canada, and California. Monitoring: Reports, photos, and maps from monitoring efforts around California. Pest Risk Assessments: A list of assessments nationwide and from around the globe. P. ramorum Multilocus Genotyping Database: Developed by the USDA ARS laboratory at OSU, the searchable database is intended to provide timely information on new isolate detections in an effort to facilitate the identification of migration pathways. Host plant species, detection location and date, lineage, mating type, and other relevant information is now available for hundreds of P. ramorum isolates from nurseries throughout the US. P. ramorum Risk Matrix: This document includes hosts, symptoms, disease distribution area, and general experimental methodology. 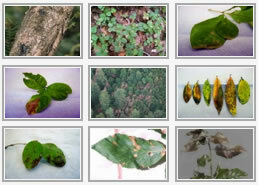 The species, commodity, available scientific data, and the principle investigator are also listed. See the full Science Panel Report and the Science Panel Members. This document is a draft assembled by USDA-APHIS, Center for Plant Health Science and Technology, Raleigh, North Carolina in summer 2004. For more information contact David Kaplan or Russ Bulluck. P. ramorum Research Websites: List of websites from some of the research organizations that are addressing various aspects of P. ramorum.